I've written before about the fantastic range of fresh and local produce that I can buy at the Clarkston Farmers Market. The last market of the year was on the Saturday before Christmas and as I had a few orders to collect, I made my way to market on a very cold and wet morning. Despite the poor weather, all of the stallholders were in high spirits, everyone looking forward to putting their feet up to enjoy Christmas with family and friends. After collecting my chipolatas and streaky bacon (for the perfect pigs in blankets) from Lochbyre, some pâté and terrine from Creeside Charcuterie, a collection of sorbets from Thorntonhall Farmhouse Ice Cream, a delicious Christmassy biscotti from Vanilla Buffets, and plenty of tasty treats from The Wee Fudge Company, I noticed that there was another newcomer to the market. Rice n Spicy is run by Rashed Ghani, who was busy cooking up samples of spicy rice and flavoursome keema curry, filling the air with a spicy aroma. Rice n Spicy want to share the authentic taste of the Punjab, which has been passed down through the generations from traditional family recipes. Rashed's aim is to share his own love & passion for cooking with the people of Lanarkshire and beyond. I have always had a passion for cooking and this year has presented the opportunity, due to redundancy, to share this with a wider audience. This started as an idea in June with a tasting session with a friend who I had not seen in over 10 years and has gone from a concept to a fully running business in just over 4 months, this has involved a tremendous amount of work from food legislation to converting my garage into a fully commercial kitchen. Research your market and listen to customer feedback, don't be afraid to follow your dream if you truly believe in it and finally invest both time and finance to do things correctly, never cut corners. If a job is worth doing, do it right. In 5 years time I would like to see 'Rice n Spicy' become well known throughout Central Scotland and beyond as a brand associated with quality Punjab cuisine, known for its reputation of using quality ingredients and providing good honest food. We are working hard to increase our customer base and have already started supplying small retailers and offer mail order throughout the UK. Now that's a hard question to answer, personally I feel that the tastiest curries are vegetable based ones. For this reason it would have to be baby aubergine and fresh new potato curry, my absolute favourite, lightly garnished with fried homegrown spring onions and garlic chives. That's too easy! The one person that I would invite would be the inspiration behind Rice n Spicy, my Dad the late great Abdul Ghani. All my recipes are based on his traditional style of Punjab cooking. On the menu would be his slow cooked Lamb curry served with his traditional roti and homemade fresh mint chutney, I've mastered the chutney but still working on achieving the taste that will take me back to my childhood for the lamb, it's a work in progress. Indian takeaway wasn't in my thought process when I left the house in the morning but after sampling the keema curry, I was keen to try the other dishes, so Saturday nights dinner was easily taken care of. 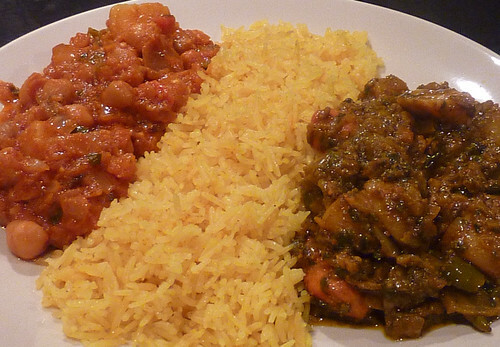 I love vegetable dishes so chose the chick pea curry, and saag murghi (chicken & spinach curry), along with pilau rice. All of the dishes came in 650ml packages declined to serve two adults easily, although I'm sure that with some starters and naan bread, there would be enough in the two dishes to serve four. Our dinner was delicious. Both meals were full of flavour, the chick pea curry cooked with fresh tomatoes, chillies and potatoes, packed a spicy punch. While the chicken and spinach was heavily flavoured with cumin, coriander and garam masala. 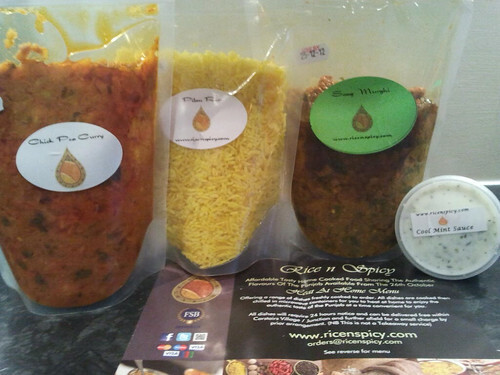 Lanarkshire Farmers Market have done a fantastic job in putting together a great lineup of local producers, and I'm sure that Rice n Spicy will be a brilliant addition to the regular markets. I normally look forward to the last Saturday of the month as I know that it's Clarkston Farmers Market day, or as it will now be known.....Curry Night! 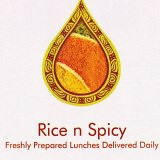 Keep up to date with Rice n Spicy on Facebook and Twitter.